Five months into World War III, Ellie and her four remaining friends have barely escaped the Australian town of Wirrawee with their lives and their sanity intact. But as the nightmare continues, they realize they must once again sacrifice their hard-won comfort and safety. A group of soldiers has recruited the kids to guide the way to the Wirrawee air base for a risky sabotage mission. What could possibly motivate Ellie and her friends to return to the heart of the conflict? It may be their only hope of rescuing the families they left behind. 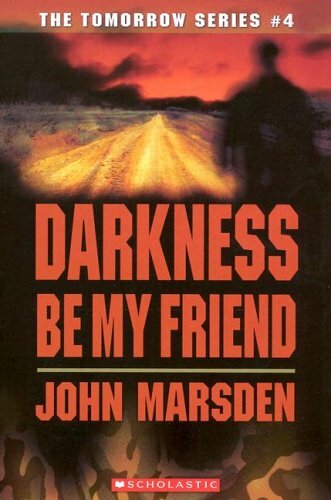 Darkness is an appropriate title for this book - it is the darkest point in the series emotionally for these kids. Considering all the horrible things they've witnessed and the safety they've given up to try to make a difference, they're just barely surviving at this point. It's hard to talk more about this installment without giving away too many spoilers. It's also hard to appreciate a book when it puts the characters you love through hell. But Marsden does such a good job at keeping it honest, at ensuring that they don't succeed 100% of the time at their sabotage attempts, that it's really the only way to have written this book.